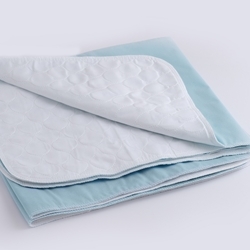 SUPER SOAKER White Twill Quilted 34" x 36"
This 34" x 36" White Twill Quilted reusable Underpad has a closely quilted top layer which consists of a 55% cotton 45% polyester top and a 10 ounce soaker to absorb urine from incontinence. Sewn with a closely Quilted Top Layer which consists of 55% cotton 45% polyester. Below the Quilted Top Layer is a Super Soaker™ 10 oz/per square yard 95% polyester 5% rayon soaker. Below the soaker is a poly vinyl chloride (PVC) waterproof back barrier. Blue in color. It is designed to withstand Industrial Strength Washing & Drying Machines (also launders GREAT in home washing and drying machines). It will last hundreds of washing's if laundered properly. Do not exceed 168º F drying temperature.